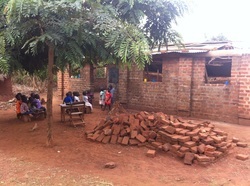 The HORD has begun its own orphanage Primary School in March 2010 in the rural Bussiwa village in kamuli district. People live in small grass hatched houses, often large families in one room. The people who live in these rural villages are very poor to the extent that they cannot even try to care for their families. The children here have as much right to education as any child.Schools in Uganda are very different from those ones in developed countries. There are very few government schools with nearly all schools being self funded by school fees. That is the only way that the children will have any hope of a chance to get an education but the problem still remains that many of these children cannot afford the fees which can be anything from $8 per term upwards. This school really will not last long & is not right or a healthy learning environment as we are now using the church structures as class rooms from Monday to Friday. These children deserve to learn in a better school, one that has a clean solid floor, desks that sit 3 children, not 6 & space in the classrooms for these extra desks. They need a roof that does not leak water on them like a shower whilst in class. In order for this to happen we need to build our own concrete school & soon! Our land size is so small so we cannot build out so we must build up! We are desperate to build a school these children can be proud of & within which we have the facilities to give them a clean & safe place to come & learn. The reason that the why HORD open up our orphanage school really stems from the when all sponsorship which were being given to HORD by different where terminated due to exorbitant increments in the cost of operation by the sponsoring schools. SO HORD has chosen looking for help by looking for finding sponsors for the teachers & by raising the money to build an orphanage school for these wonderful children. The classes range from Baby – primary 5 which spans an age of approx 3 years – 12 years. The site is tiny, but they will have to survive and the desire to keep the children in school and not become beggars and thieves is huge and to help them not be subjected to child labour and early marriages. Simon the founder of HORD has spent a lot of time looking at the finances of the school which is running at a loss and, with no potential surplus income which can be put back into the school or pay for repairs, text books or anything that can allow this school to grow & develop. The teachers are AMAZING. They have a wonderful dedication to the children and their learning and often there has been no money to pay them. They have families of their own to support so the knock on effect is huge, but they keep coming to school each day to teach regardless. These teachers have shown such a massive commitment to children; it is so inspiring. 80% of the schools income goes on paying the teachers. There is no money available to feed the children a healthy balanced meal or improve the standards of the school, its equipment and the children’s learning experience. If we don't find a way to help, this school will be forced to close too and the future of these children will be bleak. That is why we have launched the Teacher Sponsorship Scheme. It will give individuals/schools/businesses and other organizations the opportunity to sponsor a teacher. Teacher sponsorship starts from $50 per month and we have 12 members of staff at the school so we are looking for 12 sponsors. Your sponsorship will be the whole monthly salary for the teacher you sponsor and will go direct to them. You will receive correspondence from your teacher so you can follow their journey and see what a difference your support is making to them and to the school. We have looked at the finances involved with building An orphanage school on the space we have. We need 9 classrooms, plus 2 dormitories, toilets etc…& an office as a minimum. HORD would like them to also have a small room as a library as right now they have no books, or even text books of their own. Music is something that is hugely important to children in Africa, dancing & singing is a normal part of their life & culture. HORD have provided the children with new drums, xylophone & choir costumes but we would like to give them a music room so they can practice & be in a position to take their music out to the public & give performances. Right now on our little space we need a three storey building. The minimum cost for this is $ 13,719 an Equivalent of 10,000 Euros which may seem a lot but if you compare it to the cost of schools in the developed world really is nothing for 600 children. If you can help us help them we would be so grateful. We ask that you prayerfully consider giving to HORD. We need your help, as we operate entirely on the voluntary donations of people just like you. And for that, we say thanks. Your gift will truly change the lives of vulnerable Ugandan children. There are various ways you can give, be that a one-time donation or partnering with us by way of a monthly donation subscription.